As children, we have all found treasure in the most bizarre places. Sometimes it probably was an amazing stick, a slimy toad, or even a shiny rock. However, most of us forget about our dreams of finding jewels and precious stones when we grow up. 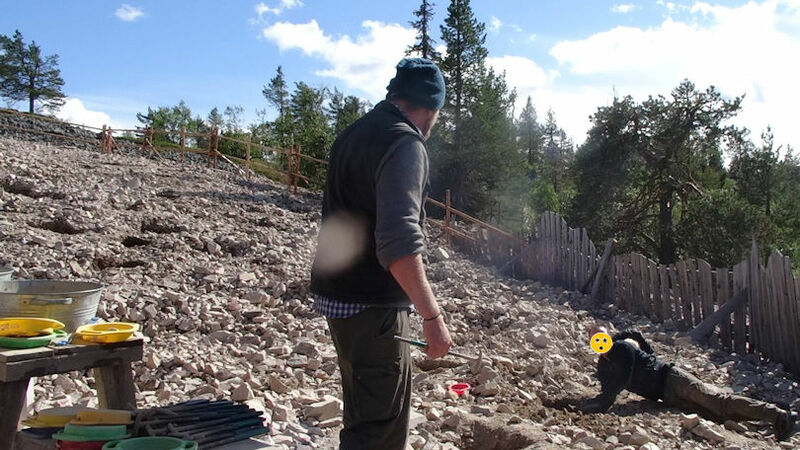 We advocate finding your inner child every now and then, so we decided to go and dig for treasure at Lampivaara in Lapland. Lampivaara Amethyst Mine is located in Sodankylä and Pelkonsenniemi municipalities in Lapland, between Luosto and Pyhä travel centers. We got up early so we could have enough time to dig and explore. 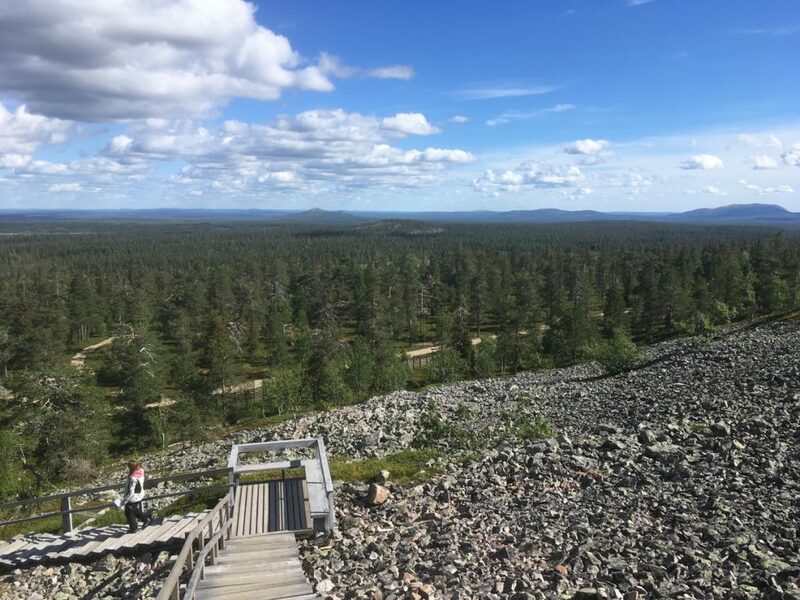 The mine is actually in the middle of Pyhä-Luosto national park, and as you might have already learned from our site, driving your own car in the national park is forbidden. You cannot therefore reach the mine by car, you must walk or ski there. The shortest path to Lampivaara Amethyst Mine leaves from Ukkoluosto parking lot. It’s a beautiful trekking path, which ascends somewhat. There is a lot for everyone to explore on the way to the top of the hill: plenty of unique flora and fauna that have adapted to the freezing conditions of Lapland. 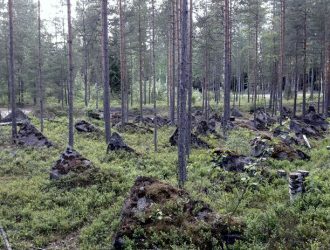 You can also see stone fields (rakka in Finnish) on the sides of the hills, some covered with moss, some bare and gray. These barren rakka fields are believed to have been created due to the weathering, i.e. breaking down of the hill. The distance from the parking lot to the mine is approximately 2,5 km. The mine is situated at the top of Lampivaara hill and there are some stairs involved. Tickets to the mine and tours are booked from the cafe at the bottom of the hill, where restrooms are also located. We had water bottles and some snacks with us, but we were not able to resist freshly baked donuts in this cafe (the scent was incredible!). Just ask for the traditional rinkilämunkki in Finnish, if/when you feel tempted. An alternative route to Lampivaara is slightly more challenging, and 3,3 km long. It departs from Rykimäkero parking lot along the road Pyhäluostontie. It also leads to the cafe, where the two paths cross. 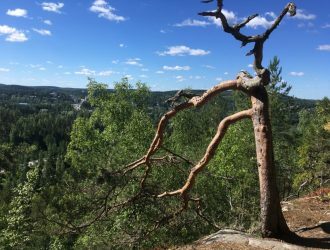 The views from the top of Lampivaara are almost as spectacular as rinkilämunkki at the bottom of the hill. Guided tours that start every hour are informative and available also in fluent English. The tour takes about an hour and includes a refreshment inside the mine. 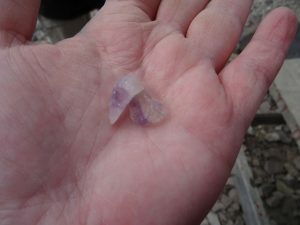 At the end of the tour you can start digging to find your own lucky amethyst from the ground. Larger groups can book their exclusive tours from the cafe. Don’t be upset if you see buses or other motorized vehicles inside the national parks, those cars have special permits to drive there. Amethyst is considered as the jewel of Lapland, and Lampivaara is the Europe’s only active amethyst mine. Amethyst is a violet variety of quartz. It is a semiprecious stone often used in jewelry and is the traditional birthstone for February. The Greeks believed amethyst gems could prevent intoxication, while medieval European soldiers wore amethyst amulets as protection in battle in the belief that amethysts heal people and keep them cool-headed. If you are unlucky and unable to find your own piece of jewel in the mine, there is a little shop with the most precious stones found from the site. There also is another amethyst shop in Luosto centre, and you can also book an organized tour to the mine from there. Thankfully we found some lovely ones and we are very proud of our efforts! Treasure found! How to get there: You can get to Sodankylä and the Luosto nature area by car or by public transport. 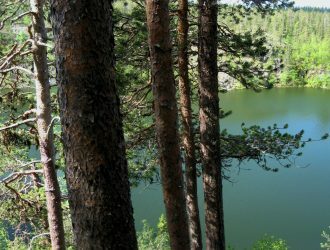 Car: The shortest hiking route is from Ukkoluosto parking area (2,5 km) which will take approx. 35 – 45 min/one way to the Lampivaara Café. Bicycle: It is possible to cycle in these parts of Lapland but just remember that distances are enormous. Public transport: It is possible to get to Sodankylä and Luosto by bus. The best routes are from Rovaniemi city to Luosto. 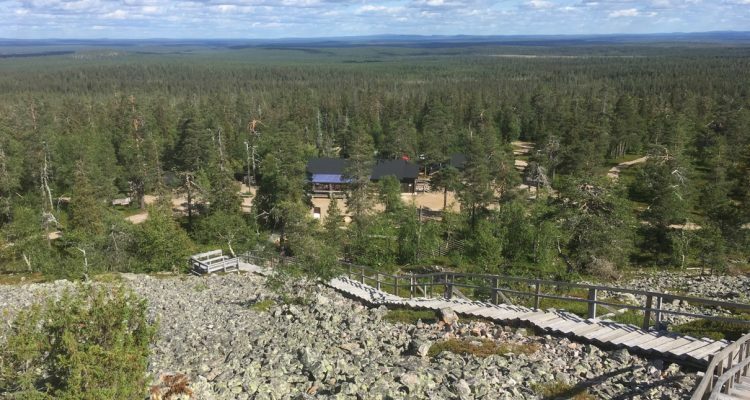 When you get to Luosto, you will have to walk about 5,5km to reach the amethyst mine. Check out timetable for Matkahuolto buses here: search for rides from Rovaniemi to Luosto (Sodankylä). There are also SkiBuses between Rovaniemi and Luosto. When to visit: We recommend visiting the mine during the summer season from June to September when the mine is open every day from 11 to 4pm, and the entrance fees are 18,50 €/adult and 10 €/child. Part of the mine is covered, so digging amethysts is possible also in the winter. You should note that in the winter you can reach the cafe by skiing or snowshoes, or you can travel there with Amethyst Pendolino, which is a wagon pulled by a snow machine. It departs from Luosto center, stops at Ukkoluosto parking lot, picks up the rest of the people from the cafe, and then takes everyone to the top of Lampivaara hill. The prices vary depending on where you hop on. For up to date information about the opening times and prices, please visit the Lampivaara Amethyst Mine website. What to wear: Remember your mosquito bug spray during the summer time. Even though there won’t be any bugs on top of the hill due to a constant breeze, there will be blood-thirsty bugs waiting for you lower down during your walk up. Wear clothes you don’t mind dirtying if you want to dig for amethysts. Also remember that you are in Lapland and on top of a high hill, so it can very quickly get cold. It is always easier to take off extra clothes than try to figure out which pine needles warm you up the most if stuffed inside your clothes (they won’t, by the way). 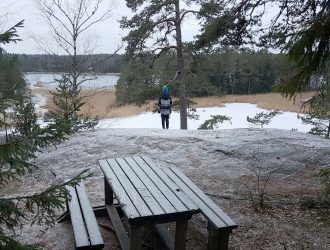 Accessibility: The lovely paths around Ukkoluosto are well-maintained and accessible even to wheeled vehicles such as wheelchairs and children’s buggies. If you are going to the mine, to get on top of the hill you will have to walk up quite a few steps, so this is the only path that is not suitable for those with mobility issues. There are, however, platforms with benches where you can easily stop on your way to the top of the hill mine.